CBSE Merit Scholarship for Single Girl Child of Class X - 2018) / CBSE Merit Scholarship Scheme for Single Girl Child/ CBSE Single Girl Child Scholarship application form 2018, Apply by October 15. CBSE Scholarship Scheme. 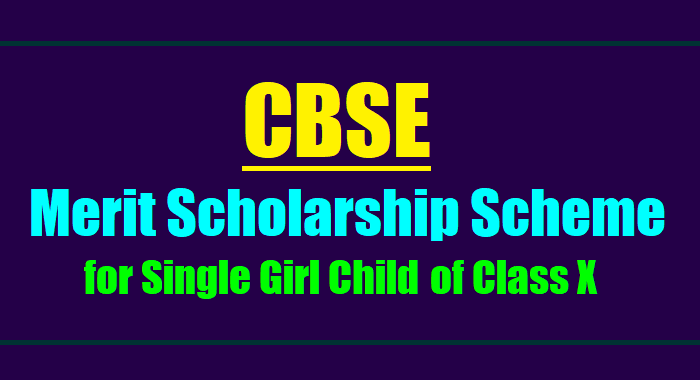 CBSE Merit Scholarship Scheme for Single Girl Child of Class X passed in 2018 and Renewal of 2017: CBSE Merit Scholarship for Single Girl Child: The objective of CBSE merit scholarship scheme is to provide scholarships to the meritorious Single Girl Students, who are the only child of their parents; and have passed the CBSE Class X Examination with 60% / 6.2 CGPA or more marks/ grades and are continuing their further school education of Class XI and XII. The scheme is aimed to recognize the efforts of the parents in promoting education among girls and to provide encouragement to meritorious students. The Central Board of Secondary Education, HQ Delhi invites 'Online applications' from the students who have passed Class X Examination 2017 for the award of under Merit Scholarship Scheme for Single Girl Child. CBSE single girl child scholarship application last date extended: The Central Board of Secondary Education (CBSE) has extended online application deadline for single girl child scholarship schemes. The last date of the application submission has been extended for CBSE Merit Scholarship Scheme for Single Girl Child for Class 12 studies, and Renewal of Online applications of CBSE Merit Scholarship Scheme for Single Girl Child Class 10 Pass awarded in 2017. For CBSE Merit Scholarship Scheme for Single Girl Child for Class 12 studies 2018, the application date has been extended till October 15, 2018. For Renewal of Online applications of CBSE Merit Scholarship Scheme for Single Girl Child Class 10 Pass awarded in 2017, the online application submission date has been extended till October 15, 2018. The hard copy of the application (renewal only) submission last date is November 15, 2018. For more details, the students are advised to visit the official website of the CBSE Board: www.cbse.nic.in. The Central Board of Secondary Education (CBSE) has released a notification regarding scholarships for female students who have secured above 60 per cent (or 6.2 CGPA or more) in Class Xth examinations this year. The notification stated that girls with the said scores, who are studying in schools affiliated with the CBSE, will be considered for the scholarships. However, it added that the tuition fees of the school must not exceed Rs 1,500 per month. Non Resident Indians (NRI) students can also apply, but the monthly fee for such students should not exceed Rs 6,000, it stated. To apply, students need to key in roll number and certificate number online. A print out of the same should be posted to the Scholarship Unit of CBSE by November 30. The online forms will be available till October 15. CBSE Merit Scholarship Scheme for Single Girl Child for plus 2 Studies: The Central Board of Secondary Education (CBSE) has opened the window for scholarship application for class 10 passed single girl child. The objective of CBSE merit scholarship scheme is to provide scholarships to the meritorious Single Girl Students, who are the only child of their parents; and have passed the CBSE Class 10 Examination with 60% / 6.2 CGPA or more marks/ grades and are continuing their further school education of Class 11 and 12. The CBSE Merit Scholarship for Single Girl Child scheme is aimed to recognize the efforts of the parents in promoting education among girls and to provide encouragement to meritorious students. As per the approval of the Competent Authority, all children born together are Single Girl Child of their parents. The number of scholarships for a particular year shall be variable and shall to awarded to all such "Single Girl Students" who have secured 60% / 6.2 CGPA or more marks / grades in the CBSE Class 10 Examination in that year, said the notification from CBSE. (i) should an Indian national. (ii) should be the girl child and only child of her parents. (iv) the tuition fees for Class X should not be more than 1,500/- per month during the Academic year. In the next 02 years the total enhancement of tuition fee shall not be more than 10% of the tuition fee. The rate of scholarship shall be Rupees Five Hundred (Rs. 500/-) per month. A Scholarship awarded under the scheme shall be paid for a maximum period of two years. Payment will be made through demand drafts/ ECS. The Central Board of Secondary Education has released a notification regarding scholarships for female students who have cleared their class 10 exams. Students who wish to apply for a scholarship can do so from the official website of the CBSE (cbse.nic.in). The scholarships are available only for those students who have passed class 10 Board exams from school affiliated with the CBSE. There are two schemes available for students— the first is a “CBSE merit scholarship scheme for single girl child for +2 studies 2017” and the second is “renewal of online applications of CBSE merit scholarship scheme for single girl child X pass awarded in 2016”. The eligibility conditions for each of these schemes are available on the Board’s website. CBSE has called for applications both online and offline. The last date to apply for the scholarships online is on November 15, 2017. For the hard copies, the Board has announced in a notice that the last date for the same is on November 30, 2017.
a) Student should have passed Class 10Examination from the CBSE and secured 6.2 CGPA or more. b) Pursuing Class 11 & 12 from CBSE affiliated Schools. c) Student (Girl) should be ONLY CHILD of their parents. d) Original Affidavit duly attested by the First Class Judicial Magistrate/ SDM/ Executive Magistrate/Notary as per prescribed format available on the Board's website. (Photocopy of Affidavit will not be accepted). e) Application form should be attested by the School Principal from where the student is pursuing Class XI after passing Class X from Board's Examination. f) Tuition fee should not be more than Rs. 1,500/- per month in Class X and 10% enhancement for Class 11 & 12. Steps to apply for CBSE scholarship 2018:Step 1: Go to the official website of the CBSE as mentioned above. Step 2: Click on the link for “CBSE Merit Scholarship Scheme for Single Girl Child of Class X passed in 2017”. Step 3: Go through the instructions and information provided and check your eligibility. Step 4: Click on the link provided to apply. Step 5: Fill in your details, submit your application and save a copy of the same for further reference. 1) Candidate need to enter her roll number and certificate no. (as printed on the class 10 grade sheet) in order to submit the online application form. 2) Enter all your particulars carefully and submit the form. 3) Note down the Registration Number shown on the page. This will be used while uploading documents and also for all other future communications. 4) Print the undertaking as provided in the "Guidelines Document" (this document), fill it, paste the photograph and get it attested from school. 5) Prepare affidavit, as per format provided in the "Guidelines Document". 6) Scan the above two documents, ie Affidavit and Undertaking so as to create JPG image file of up to 1MB size. 7) Go to "Upload Document" option and upload both the above documents. 8) Go to print "Confirmation Page" option and generate the confirmation page. 9) Send duly filled and signed confirmation page to "Scholarship Unit", CBSE, Shiksha Kendra, 2 Community Centre, Delhi - 110092. Last date for submission of online applications: 15-10-2018. Last date for submission of Hard Copy: 30-10-2018.